It’s no longer a question of 100% drought coverage for the stricken state of California. That barrier was crossed months ago. Today, it’s how severe that drought coverage has become. And in a state that is sitting just east of what appears to be a years-long impenetrable barrier of blocking high pressure systems, the situation just grows worse and worse. For Californians now used to watching storm systems veer far to the north, carrying their precious load of moisture away from the state, the water scarcity situation grew more dire last week as nearly 82 percent of the state slipped into extreme and exceptional drought. These two aridity ratings are the highest levels provided by the US drought monitor. The other 18% of the state not covered by these two extremes merely sweltered under severe drought conditions. To the east and north, other states quietly slipped into total or near total drought coverage as well. Nevada shows 100 percent drought coverage with Arizona, New Mexico, Utah and Oregon not far behind at 90% + coverage. It’s a situation that will continue to deepen so long as a climate-change induced long-term blocking pattern remains in place. And as of mid summer, there appears to be little to over-ride a freakishly persistent weather pattern that has now lasted into its second year. Throughout the state, signs of aridity abound. Hydroelectric power supplies are in jeopardy, cities are hiring water police to ensure restrictions on use are enforced, the state’s agriculture has lost more than 2.2 billion dollars so far this year, and drilling into the limited supply of ground water has reached a record pace. Snow pack stores in the state’s Sierra Nevada Mountain range are long since melted. Exposed glaciers are now dissipating at record rates with some glaciers seeing 70 degree (F) temperatures on their lofty perches atop 12,000 foot high mountains. Overall, current rates of glacier loss, if sustained, will render the entire Sierra Nevada Range in California ice-free within just 60 years, according to recent estimates. 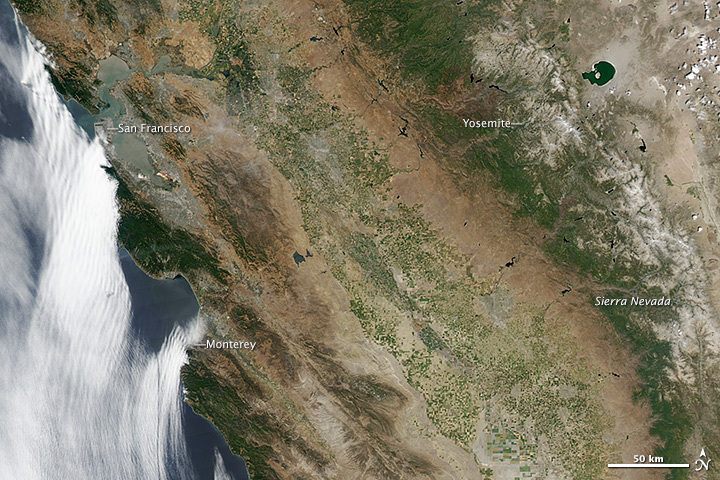 Note that as of June 24 of 2014 the Sierra Nevada showed no snow coverage in the satellite picture. This compares to recent years during the 2000s and 2010s when snow pack, though greatly diminished from past decades, typically remained on some peaks throughout the summer. Now all regions are devoid of white, cooling, water-providing snow and even the glaciers have taken on a dirty gray and brown pallor. Central to the story of the years-long loss of California rainfall is a large, high amplitude ridge in the Jet Stream that has tended to dominate over the US and Canadian West Coast and a broad section of the Northeastern Pacific. This ridge has involved a powerful south to north flow of air up over the Northeastern Pacific and North American West Coast. This flood of air often invaded the Arctic before swooping down to deliver cooler air to the Eastern United States even as the US West Coast sweltered and dried out. This high amplitude ridge in the Jet Stream is thought to have been facilitated by a general loss of snow and sea ice cover that has only intensified since 2007. For over the past seven years, not one day has seen average sea ice coverage in the Arctic with typical sea ice extent and area values ranging between 20 and 50 percent below levels seen during the late 1970s and early 1980s. Such a major loss of ice coverage is thought to be pulling the Jet Stream north even as it makes it more wavy. These large waves, called Rossby Wave patterns, tend to get stuck, as has been the case with the Pacific Ocean ridge. This sticking weather pattern has lead to hot and dry conditions persisting over California for more than two years now. Earlier this year, a major warming event in the surface and subsurface waters of the Equatorial Pacific raised the possibility of a potential strong El Nino later this year. But atmospheric conditions have continued to remain unfavorable for strong El Nino formation. Ironically, the very same powerful high pressure systems enforcing heat and drought over the US West may also be strengthening the equatorial trade winds and inhibiting El Nino formation. A strong El Nino may have broken the blocking pattern and delivered an epic surge of moisture to the US West Coast (one that may well have set off extraordinarily powerful storms for the region). But now, NOAA only forecasts a weak-to-moderate event and the potential exists that no El Nino will form at all. This is bad news for Californians suffering under one of the worst droughts ever recorded for the state. It raises the potential that the West Coast blocking pattern will remain in place for another year or more. And with highs continuing to form and deepen off the US West Coast, as the potential for a strong El Nino fades, there appears to be little hope for relief for an already hard-hit area. SAN JOSE >> It was another balmy, breezy summer day Monday, with a high in San Jose of 79 degrees, far below the record temperature of 97. Oakland was even cooler at 74, and as usual, San Francisco’s high of 70 was cool enough to bring out jackets. But beneath that simmering surface calm, the ground was heating up at a record rate — and the California weather landscape was shifting with it. Just how fast the state’s climate is changing became apparent Monday when the National Oceanic and Atmospheric Administration released figures showing the first six months of this year were the hottest the state has ever recorded — breaking the mark by a single degree after 80 years. 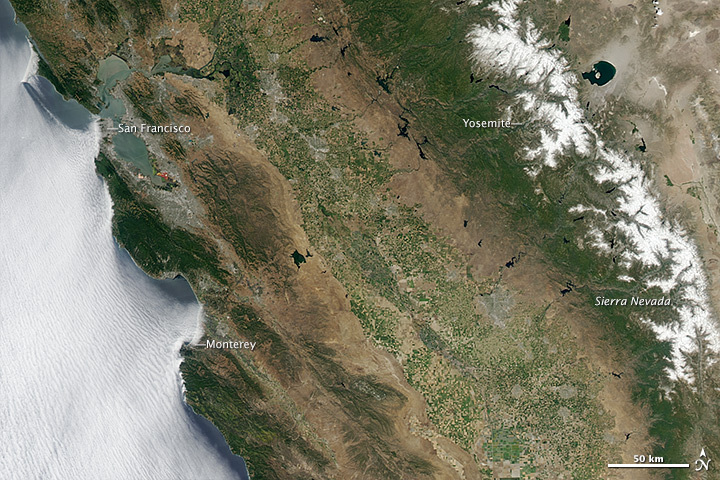 That record came hot on the heels of 2013, California’s warmest year ever. 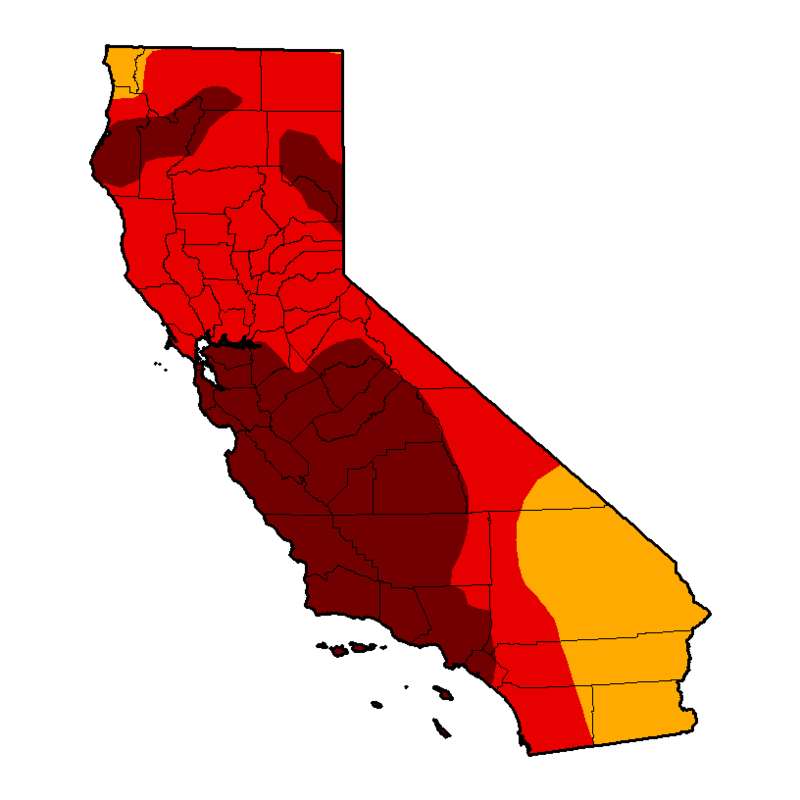 And the NOAA figures came just four days after the National Drought Mitigation Center unveiled a map that revealed 81 percent of California is experiencing “extreme drought” conditions. Under normal circumstances, drought and heat aren’t necessarily connected — it can be bone dry even when temperatures are mild — but for the first time in decades, experts theorized that the drought is now affecting how hot it gets. California made history, too. A warm June helped the state log its hottest start to the year on record, with a temperature 4.8 degrees above the 20th century average for the six-month period, and 1.1 degrees above the previous high in 1934. 4.8 F or C? Either way a pretty extreme departure. Heatwave, heat dome, high amplitude ridge, drought. That’s been the growing pattern we’ve been monitoring globally. A back to back record for California would be telling. Mark another one down for Francis. Bad news for California, though. One month’s worth of rainfall hit the area in the space of a few hours. Yes I drove back through Gloucestershire on Saturday with a spectacular display of atmospheric physics in progress! The press report a month’s worth of rain fell there in 24hrs, which I can well believe. Pretty amazing event. UK is probably in for a lot of rough weather going forward. Spike – In Somerset, I measured 36mm in 24 hours (Whilst vaguely wondering what the result of a lightening strike on my solar array would be). Good for the garden, though. I don’t think I’ve ever seen weather like that – a continual train of thunderstorms for about 24 hours. Robert – we are certainly seeing extremes, but unless we lose the Gulf Stream – which I don’t see as likely – the UK gets off relatively lightly under global warming. It’s places like California, where relatively small shifts in temperature and rainfall transition the climate from ‘Mediterranean’ to ‘Desert’, or Bangladesh, where a small change in sea level transitions the land to sea, that will really see problems. The UK stares down the barrel of a weather and ocean-wrecking gun. Gulf Stream weakening now under way. This winter was a prelude. The dead and dying pine trees hit by the beetle epidemic — which peaked in about 2006 — cover more than 16 million hectares of forest. The area, five times the size of Vancouver Island, straddles the Interior but also stretches into the northeast and Okanagan. Scientists expect the fire behaviour problems caused by the beetle epidemic to last 15 to 20 years. With a background in Sociology, History & Psychology I have been watching the climate crisis develop for at least 30 – 40 years. Lately, to protect my own sanity, I have classified events as “Natural History” encompassing at least two experiments in a closed system. 1. What if there was a species that developed a complex brain that allowed them to manipulate their environment as a survival strategy? It seems that this capacity to invent not just tools, but also stories (justifications) has gotten us into a nasty cul-de-sac. “How’s that big brain thing workin’ out for ya?” Unfortunately, a very large group of us humans uses this large brain is a means of denial of reality or to imagine a fantastic last minute escape. 2. The second is the easy energy (carbon) part of the experiment, where we can dramatically increase our survival and procreation, but with the side effect of poisoning our environment. This is the Earth as a very large closed system (can you say petri dish) that we alter in term of energy and chemistry. We are just now beginning to see the consequences of our actions; with more to come I’m afraid. What we need is a radical re-assessment of the place of the Human species in our global environment. For perspective on how climate change is affecting lakes, those of us here in the U.S. can just look across the pond, where scientists and the agencies involved in meeting the European Union’s Water Framework Directive have amassed an impressive body of research on the topic. Not only are extreme weather events such as droughts and intense rainstorms becoming more common, climate warming is leading to increased algal growth and more frequent toxic algal blooms. It also affects the entire aquatic food web, including the number, size and distribution of freshwater fish species, according to the latest research. New evidence from studies in Europe shows that a warming climate, in particular, is already having a profound impact on lakes, according to Dr. Erik Jeppesen at Aarhus University in Denmark. As I have noted in earlier posts, this is an important issue because other studies show that lake temperatures are on the rise throughout the world. Two leading European freshwater research programs are REFRESH, studies of adaptive strategies to mitigate the impacts of climate change on freshwater ecosystems, and MARS, focused on the management of freshwater lakes, rivers and streams under multiple stressors, including climate change. Fantastic resource here, Bob. Thanks. Explosive growth in zooplankton = likely fish kills, likely higher sulfur species production. How long before the continuing drought in CA becomes a declared national emergency, due to its impact on US and international food supplies? One more year of drought, two…? I think it’ll largely depend on how rapidly the aquifers deplete, and if / when SF or LA institute drastic measures. If it continues for another year or two like this we could well imagine water sources growing quite scarce. National emergency probably depends on how long the various municipalities would retain resiliency under such conditions. I’d think that water management becomes both spartan and innovative. The blow to Agriculture would be terrible for the US and world, though. We do keep getting WWBs over the western Pacific. But they have a lot of work to do to propagate a strong new Kelvin Wave. In the meantime, it looks like SSTs cool along the equatorial Pacific for a bit. July might well be another hottest month on record or close to it. Summer heat lag due to ghg forcing and northern polar albedo loss could also keep global temps near or above records for August and September, maybe October. With El Niño, the warmth would generally be higher. Without, a bit lower. If the same trend continues than I would expand that to include Oklahoma, Colorado & Kansas. Texas is already there, as is NM, AZ, UT & NV. International food supplies would be crippled. We need to keep an eye on South America this winter. I doubt we’ll see much improvement if any for Australia. Midwest aquifer is being decimated, wells are drying up. Yes, perhaps global warming induced food shortages will get the attention of policy makers who can move us in the direction of a less carbon-intensive economy. Good one. I wonder how many hungry climate change deniers watch Fox News? My bet is that most are currently rather well-fed. Speaking of amplified atmospheric patterns, it is not often (well, at least in the past) we see “strongest ever observed” from meteorologists. This is from WSI Energy Blog regarding the upcoming blocking pattern over North America. Interesting. Another hot north, cool south dipole anomaly. Will want to take a look at the model runs for the northern hemisphere as a whole. T2m from NOAA shows ridge continuing in the West (again), trough in central US, ridge over Greenland and Quebec, ridge over Western Europe, tough over western Russia and strong ridge over eastern Russia and Siberia. This will have one hell of social impact if it doesn’t break within the next 2 years. I guess they will start building desalination plants, but given the size of the population that will be one expensive process. That solution probably wouldn’t help with the food production. That about sums it up. If they go the desalination route, pray that it’s renewable energy based. Very energy intensive. Hooking that horse up to the carbon cart just gets to climate change game over that much faster. I think it is brilliant. Simple to make and very effective use of the sun’s energy. Fantastic!! Hadn’t seen this yet, but had guessed it was just a matter of time. Did also see that Australia ditched its carbon pricing regime. Sad to see that. I think Abbott is all sorts of unprintable things. I am not much of a conspiracy kind of guy, but I am starting to wonder. Could these guys actually be that ignorant, or perhaps they have their briefings and are actually planning for the strongest nations defend the best, regardless of the cost to the rest. No, it doesn’t seem possible, but such blatant disregard has to make you wonder. It’s pretty sick. But there’s plenty of blunders in human history that happened simply due to economic power inertia. The closest corollary is slavery. Except in this case the harm is foisted on those of us surviving in the future. Fossil fuels generate wealth for a very influential few. So you have to destroy that power base before the inertia fades. Desalination is expensive water (good for urban, bu not agriculture). It is also a power hog, and water is used for coal, gas as well as hydro. Add time to permit & construct and I would not put much faith in a short term fix from desalination. They will likely mine water faster is my guess. Plus, desal creates huge amounts of brine that need storage and disposal, etc. Better, but they still only quote or invite scientists 12 percent of the time. Really? Might sound like an achievement, but coverage is still abysmally low compared to 2007 or 2008. Cork makers require bark that’s at least 27 millimeters thick to create their goods, but many of today’s trees are producing bark between 3 and 10 millimetres. If climate change is real , then every living thing , from viruses to blue whales is trying to adapt. What we triggered is not the speed of the Chicxulub Impact , but it is something very close to it. If everything is as we knew it, has not changed , why is the biology of the Earth changing so fast ? Why are these cork trees changing ? We’ve been using cork since the Greeks . Probably related to elevated NOx levels. Speaking of trees, this got a lot of attention at realclimate a few weeks ago. What was the reaction there? The solution is the same for climate change, ozone/NOx/radical oxygen species pollution and so called peak oil (I’d call this problem oil dependence instead). Simply to stop burning fossil fuels as fast as possible. Philosophic arguments about whether alternative energy can provide enough are moot in the face of the fact that continuing to burn fossil fuels wrecks the future. If we want to enjoy any correlary to current civilization, we need to base it on renewables and not something inherently toxic. The underlying push of the peak oilers appears to be for a vast austerity, a vision they seem to enjoy. I can’t help but wonder if this push is, at least in part, political. My view is that austerity will tend to be fought at every turn and that alternatives are necessary to speed a transition away from harmful energy sources. Their academic energy density/EROEI arguments are proven wrong again and again. And again and again it becomes obvious that delays to alternative energy adoption are entirely political and not practical. We’ve been captivated by these sources and the related monetary interests for far too long. It’s time to free the captive consumer and jettison the fossil fuel related infrastructure. If we don’t it sinks the ship and destroys the lifeboats with a terrifying mathematical certainty. Are alternatives the solution to all problems? Clearly no. We still over consume meat and milk which are also major sources of ghg production. And we still have the problem of a population that needs to be restrained over time (by humane means such as the education of women and widely available access to birth control of all kinds). But cessation of burning fossil fuels would be a major first step and would solve the issue of a manufactured economic dependence on an energy source that is inherently toxic to both life and to climates. Every fool who believes climate change is coming , is wrong . It is already in our past . This idea that some how is the in the future is a fool. Climate change is happening now, worsening later. Some can live in denial now as they can sometimes avoid visible impacts. The age of near misses. But the stuff at the margins results in cognitive dissonance– rising food prices, increasing number of homes lost to the sea, more droughts, more flash floods, loss of fisheries. We are being harmed and impoverished by our inaction now, it is true. But like the alcoholic, so many just drown or gloss over their worries. Give it ten years. There will be few climate change deniers left that aren’t religious or political zealots bound on their own destruction. Getting that way now. But we’re not quite there. The question is, do the zombies outnumber the rest of us? Every living thing is in state of flux. At a speed they have never seen. That’s not tomorrow , it’s yesterday . Well, yes. And it’s about to get worse. Far worse if we keep burning fossil/ancient carbon fuels. The rainy season here is mostly November through March, with a little spillover into October and April. Statistically significant amounts of rain simply don’t occur in the summer months, ever. So, by mid or late April, the water in the snow pack and in the reservoirs is set for the season and will have to see us through until the following winter. The multi-billion dollar question is what will happen next winter, and in the winters of the years and decades following. The fact that there is no rain now, in July, is not really news. There won’t be any in August or September either, el niño or no, or with any other remotely plausible variation in the global weather patterns. I suppose I didn’t make it plain enough that the blocking pattern had been deflecting storms for two years now, winter and summer? In any case, it’s pretty well known El Niño would be expected to increase the potential rain during the coming winter. A weak El Niño, probably not quite as much. At the current rate of adaption, people will keep on doing so until the water actually stops coming out of the tap because most sadly don’t know any better, learning is hard you know. As long as the only response to water shortages is drilling a few more wells instead of a program combining water conserving infrastructure, educating people on sustainable water use practices and eventually relocating millions out of the drying South-West because the region simply can’t sustain a population that large, we will be suffering from “the drought,” even though desertification would be more appropriate. These would be responsible and far more effective policies. Active planning rather than reactive scrambling. I prefer the former, this age appears invested in the latter. Jamaica & other Caribbean islands getting hit too. Islands tend to be even less resilient to drought. Less flex in the smaller island ecosystems. But what if the decreasing temperature differential between the equatorial El Nino zones and the rest of the Pacific Ocean continues to lessen because of generalized ocean warming? If we get fewer El Nino’s going forward, might that temporarily mask the increase in global air temperatures? Mark I don’t think It will matter, even neutral years will be breaking records at this point. For an example look at this June. If you make a trend line from 1980 to present for June temps on NOAA, June 2014 was right on the trend line. An El Niño isn’t necessary for record breaking months considering how long we have had La Niña/neg PDO conditions. The background GHG influence is simply trending higher. Good points. And the background ghg forcing just keeps rising despite aerosol proliferation. One caveat is that any time PDO flips and the trades weaken we get a number of rather strong El Ninos that drives the atmospheric signal rapidly higher. I suppose the speculative question I raise is: does the atmospheric/ocean feedback to human warming favor heat transfer into the oceans? We have record trade wind strength. We have strong Kelvin Waves, record for the time of year in which they originate, essentially being snuffed out by suppression of the atmospheric feedback. The large blocking highs appear to be the culprits and that entrained the issues with both sea ice loss and recession/weakening of the polar jet in the north and the recession of the austral polar jet enabling the expansion of oceanic ridges in the south. Perhaps the heat shoved into the ocean keeps trying to flood back. Perhaps the Kelvin waves grow ever more intense until an atmospheric feedback is forced. If that is the case, then the PDO variance is amplified along with swings between ocean and atmospheric heat exchange. Lots of speculation. But the issue is that this Kelvin wave, the one we observed this spring probably should have produced a stronger atmospheric feedback. And for culprits in its suppression we have a blocking high that is likely associated with human warming. If this chain of reasoning is correct, then it has implications. To illustrate your point NCDC global analysis for June points out that June temperature this year surpasses the previous record, set in June 1998, by 0.03°C (0.05°F). 1998 was the super El Niño I seem to recall. The effects include an ongoing lag in the rate of atmospheric temperature increase even as ocean temps would tend to increase more rapidly (see recent work by Trenberth). That said, we still end up with warming. The knock-ons would be more stress to glacier and ocean systems. Ocean stratification would proceed more rapidly, basal melt would proceed more rapidly, and we’d have a more rapid amplification of the forcing to seabed methane and ocean carbon stores. We’re still in negative PDO, so this is pure speculation. The negative PDO and failure of atmospheric feedbacks to El Niño would have to last for decades longer. As noted above, we still end up with atmospheric warming under the human forcing and warming the ocean is probably a worse result long-term. While it’s interesting to see that the model runs with the observed ENSO cycles come close to reality, I don’t like the framing of “well it’s random and we’re cherry picking the runs” when the negative PDO explains the issue. As far as I’m aware, there are no global models with PDO but still it adds to general confusion. PDO has a big effect as we see historically. We could see this stretch out for quite a few more years, with lower overall rates of increase under current forcing for years or even decades, then rushing ahead with another PDO flip. The range, as far as decadal forcing goes swings as much as 0.4 C from positive to negative in the yearly averages. If we don’t hit near 0 C during some years of the current PDO that would be an indicator of increased climate sensitivity, not lessened climate sensitivity. The fact that we are firmly in the grips of negative PDO and still see relatively high positive yearly averages in the range of +0.15 C is a strong warming indicator and I’m surprised no-one has taken that up. During the 1950s, the values plunged temporarily to more than -0.20 during some years during negative PDO. And this was part of an overall warming occurring during the 20th Century. That said, ghg forcing was much lower at a CO2e of probably near 320-340. That’s why I hate the framing they had. It’s not enough to say 1998 was cherry picked, or we happen to have had a lot of La Nina’s or anything like that; because the very fact that warming is progressing close to trend over the last 15 years during a negative PDO is immense cause for alarm. At this point it’s a lost cause though…will just have to wait until the PDO flips and we have a quick +0.3C jump and then relentless increase. I believe that total warming might double during the next positive PDO cycle ends. Well, historically, we could expect to get to zero or even some negative years. We haven’t seen that. The 1950s saw single years at nearly 0.2 per decade anomalies even though the overall trend through the negative PDO period was essentially flat. We added +0.5 during the more recent positive swing. If we add +0.2 or 0.3 during a negative PDO swing we could see +0.8 or more during the positive phase and that doesn’t include additional ghg forcing, just current conditions. Polar amplification is where much of the warming is ongoing. So it helps when that data is included. The ‘hiatus’ was a media contrivance anyway. There is no hiatus. The ocean is warming faster than it ever was, the 2000s was the hottest decade on record, and the glaciers are melting faster than ever before. These are attributes of accelerated warming. On climate reanalyzer, the blocking high in the Pacific off of the west coast can be seen very well under preciptable water. North America looks really dry due to it. Siberia looks bone dry as well. Why are the energy density/EROEI arguments proven wrong “time and time again?” Links? Ken… We have entire countries running on 50 percent renewables. If the highly biased energy density/EROEI arguments coming from the peak oil crowd were correct, then the countries would be non-viable economically. To the contrary, large scale renewable energy production is proving to be an economic and political advantage. With the right policy measures Europe could wipe out its nat gas dependency on Russia. And that doesn’t even begin to include the positive mitigative effect related to climate change. We have solar and wind energy prices in free fall. If the biased EROEI assumptions were correct, then these price falls would not be economically achievable. EROEI is a statistical analysis based on assumptions. If the assumption going into the analysis is incorrect, then you get bad data. And if the EROEI analysis isn’t current, it can lead you to false conclusions. The issue with renewable EROEI is that it scales based on imputs. And this is good news for renewables, bad news for fossil fuels, and bad news for those who wish to drive austerity through enforced energy scarcity. It’s been pretty clear that some of the peak oilers have been undercutting renewables from the start. And, by now, those arguments are even less relevant than before as it has become abundantly clear that almost all opposition to renewable energy is now politically based and not practically based. In any case, peak oil is a good thing. I honestly hope it happens quite soon. In fact, the sooner, the better. We can survive peak oil. We can’t survive climate change or the burning of all the world’s fossil fuel reserves. The less tough, tight or marginal oil we access, the better. The less coal we access, the better. The less gas, the better. Unfortunately, peak oilers are stuck between a rock and a hard place, they don’t believe that expansion of destructive carbon production/use is possible (unfortunately, it is) and they undercut the resources that will eventually force a peaking of fossil fuel use (renewables) by economically out competing fossil fuels. It’s a tough spot to be in. So the peak oilers have my sympathies. The fact that Germany can produce a lot of its power from solar is because the coal and oil used to make and transport the panels was cheap. True, but again that is not the point. I don’t know what studies that you read, but the ones I read are simple accounting exercises. The factory that makes the panels used x megawatts last year and produced y panels so the amount of kilowatt per panel is x/y. Simple accounting, no assumption needed. The same goes for the delivery trucks/trains/ships. (The truck gets x mpg, it hauls y panels and the panels were shipped z miles — accounting, no assumptions). Peak oil is just a statement that we live on a finite planet and cannot produce infinite oil from that planet. Again, I don’t know who you are reading that says different. Of course, the oligarchs will do what oligarchs have done throughout history. They (90% of them) will hold on to their power to the detriment of everyone for as long as they can. If they can get a little more power by doing in-situ coal gassification they will do it thus keeping the engines of the insane growth economy running as long as possible. You can vote, you can protest, and you can do any other main stream political stuff that you want, but the oligarchs are in charge and do not need to listen. The Democrat/Republican show is just that. A show designed and operated to distract and entertain the common people. Have you noticed any real difference between Barry and Dubbya? I have not. Sure there are differences in style and rhetoric. They told different lies. But both did/do everything that they could to keep the oil/gas and coal flowing regardless of the consequences. We should stop burning coal and oil. Are you willing to burn the rest of the coal and oil on the planet to build the maximum number of solar panels and wind mills possible? Don’t you see? Growth must stop. Trying to use solar to give everyone the US lifestyle will kill us just as fast as using the carbon fuels to maintain our current lifestyle. We leave reality when we assert that EROEI has no basis in the cost/price equation. There’s a lot of assumptions going into the various EROEI equations I’ve seen. For example, EROEI for fossil fuels tends to be counted at the mine or well, this leaves out various life cycle subtractions. This kind of calculation, one that does not involve base standards or methods, renders EROEI academic unless all EROEI calculations are run on the same standard. In any case, net fossil fuel EROEI, depending on who you look at, is less than 10:1 now. I see solar at 7:1 and wind at 12:1. Regardless of the inherent fuzziness of EROEI accounting, I see renewables EROEI rising and fossil fuel EROEI falling. We’d expect this as fossil fuel becomes more difficult to access and renewables benefit from economies of scale. ‘Insane economy.’ What I find insane is that if you suppress replacements to fossil fuels you end up with a vast and expanding poverty and income inequality. The poor get poorer, the rich get richer, and whole systems of support generally collapse. This is the end some peak oilers envision and I’m not buying it. If we support renewables, we can eliminate some of the economic harm coming in addition to preventing the worst impacts of climate change. If we don’t support renewables, you end up with a null choice for nations that includes the kind of collapse and unrest likely never before seen. I’m interested in reducing harm, not setting up a situation where the already wealthy can attempt to profit from it and in the end get dragged down by their rank miscalculation. It’s the fossil fuel subset of growth that is most harmful. Jettison that and you have the time for population restraint, consumption restraint and all the rest. You might even increase prosperity long term, if you’re smart and benevolent and climate change doesn’t come on too fast and hard. But the pure austerity solution to Growth is a social and economic collapse in the making. There’s no good outcome there. In essence, if you don’t have the renewable replacement option, then nations will cling to the fossil fuels no matter what. There needs to be an energy system at the base of their economies. Failure to provide that will result in no shift from the current model and instead a blind clinging to it. You think climate change denial is bad now? Take away the renewable option and then see how bad it gets. In essence, the only way to stop coal burning is to give people solar. Those who do not realize that aren’t confronting the issue of captive consumerism and the way people survive today. For example, we are using the internet to have this discussion now. Can you stop using the internet in your job and day to day life? You probably work. Can you get there without some kind of transport? You eat. Can you do that without getting your food at the store. You drink water provided by a municipality can you avoid that? You buy clothes. All these things require energy and if you remove the base energy it becomes highly questionable that you can survive another way. Now there are a few people who have worked hard and managed to remove their dependency on all these things. But if you look at the millions, the hundreds of millions, who have not or cannot, then you realize the scale of the problem. Because a large portion of these activities still rely on fossil fuels. But if you change the equation and provide renewable energy as the base input, you save lives and livelihoods. And we have countries on track to do that now if they are not cut off at the legs politically. So what choice do you support? The one that saves lives and prevents suffering or the one that is a headlong run off a cliff? This isn’t directly true because of the different prices of different forms of energy. If you have a lot of cheap energy you can economically produce generation that gives back far less EROEI, which is OK until you run out of cheap energy. I agree with pintada about that. That said, I don’t buy the fundamental premise that civilization “needs” 10:1 EROEI. Consumerism, sure, but not decent living. Radical energy efficiency and reduction in consumption will enable 3-6 EROEI to be sufficient to build out renewables and have a humane existence. In that sense, many peak oilers are needless doomers, which is a shame. Oh, there is also the irony about peak oilers recognizing the different forms of energy as inherent, but then failing to talk about how most energy usage is thermodynamic/mechanical, and a huge amount of our technology uses electricity for convenience. A lot of the EROEI can’t support manufacturing goes away when you look at the prospect of using concentrated solar thermal and wind/water mills. Things may have to go back to the old days where manufacturing existed near streams/windy areas (and now sunny ones) but a huge amount of electricity or concentrated fuel isn’t inherently required. I can do some work to show you links and references regarding peak oil and EROEI, but if you really believe that building sufficient solar panels and windmills to bring everyone to a US lifestyle can happen on one planet, there would be no point. The US lifestyle argument is moot. What I’m talking about is saving lives, sustaining the opportunity for prosperity, and preventing climate change. Without renewables there is simply no way out without severe harm and extraordinary unrest. Recent figures from the Scientific American show the best EROEI is Hydroelectric (40:1), followed by Wind (20:1), Solar in the article achieves 6:1 (close to the current value of 7:1 I get in my base calculations). Coal in the article gets 18:1, Nat gas gets 7:1, Oil(conventional) is down to 16:1, while tar sands is at 5:1. Among the biofuels (carbon nuetral or carbon negative with carbon capture), we have biodiesel edging out tar sands at 5.5:1, Ethanol from sugarcane at 9:1, and Ethanol from corn at 1.4:1. Scientific American notes that a 5-9 EROEI is needed to run modern civilization. The caveat here is that this falls as efficiency increases. So from this EROEI perspect, renewables are the best choice economically for electricity generation and, as a base liquid fuel, are already competitive with oil. This does not include the externality cost of fossil fuels as it relates to climate change. So whose numbers do I believe? The Scientific American or someone who’s quoting sources from twenty years ago? In any case, as I’ve noted above, I see the numbers for solar continuing to rise which is consistent with the increasing production chain and fall of module costs. I have an interest, not in gaming collapse to benefit oligarchs, but to reduce harm. Renewables provides a path for that. If they undercut the power of oligarchs, all the better. In San Francisco are we have been experiencing a sub-tropical monsoon like flow over the coastal area for the last few weeks. Barely measurable rain occasionally, but relatively humid, rather warm weather for SF (sticky, like the east coast). The local TV weather has mentioned several times the the water temperature off the bay is about 5 degree F higher than average, low 60’s vs. mid 50’s. Seems like cold water upwelling is suspended, which may affect the local sea life because it increases the food supply. Robert – thanks for the clarification, which, had i been paying closer attention, would have noticed Gail said that it is about the precursors – which come from our industrial civilization – producing an overabundance of tropospheric ozone. i’m sure she’s well aware of the other issues though, she’s no dummy. On the renewables and scale – it would only exacerbate the existing problems (with resource extraction, population, and pollution we already can’t solve our way out of) to try to bring this totally-dependent-on-fossil-fuels-based hybrid up to replace and further generate energy for too many and counting. I don’t see it as even feasible, despite the politics – which has failed mankind miserably. Have to agree to disagree with you guys on this one. Renewables hit fossil fuels right where it hurts the most, providing one of the only rational levers for the cessation of burning, they also provide a kind of civilization safety net. The resource footprint is far less in that the primary cost is labor and materials while the externality generated is less than 10% that of fossil fuels (shrinking). In any case, saying that renewables are wholly dependent on fossil fuels is like saying fossil fuels are wholly dependent on the horse and buggy. To get there you need to do a boatload of double counting and fail to consider the inevitable tail of a legacy energy supply. I don’t think any of us know the future, and if we are going to pull a climate “Hail Mary” out of the hat, it isn’t going to happen if we are no longer producing energy. In other words, our best shot at coming up with a miracle geoengineering breakthrough, is only going to come in an environment of energy use. When one considers the unbelievable technological advancements in all fields, and how they have accelerated over time, I would not be surprised if we pulled a rabbit out of a hat. Put a little focused R & D into the problem and we might surprise ourselves. This seems a far more likely scenario to me than suddenly shutting down modern life in order to stop emitting greenhouse gases. Thing is, Doug, that the renewable tech, though not in the realm of ‘miracle’ is able to replace most fossil based sources now. Restraint is primarily policy related. Internet – I will be very sorry to see it go. Work? – Spent the morning shoveling compost – or more accurately future compost. Transport – I will be very sorry to see my car, jeep, and pickup become useless. Clothes – Well, I don’t wear the hair shirt. I would like to think that I have enough extra clothes to last out my lifetime, but can’t be sure. questionable that you can survive another way? – Damn straight. After one has spent a decade trying to build a sustainable life one REALLY understands how screwed we are. Once I reached acceptance, I realized that I don’t need to do the math for you, or try to convince anyone of anything (it just doesn’t matter), so I’ll just relate a challenge that you or perhaps a bored reader can work on. (I’m here now because I shoveled all morning.) I will cede the SciAm numbers for solar and wind. It is easy to look up the amount of power used in the world annually. SO How much carbon would be emitted if all coal burning was replaced by the construction of the equivalent amount of solar and wind? Don’t even worry about the growth required to keep the economy running during that period of time. Actually there is a book out that does just that. It isn’t pretty. As for the SciAm numbers regarding biodiesel – they are totally bogus. We have already reached the point world wide where there is a trade off between raising canola for fuel or wheat for food. That is every field raising canola for fuel rather than for food means that someone will starve so the EROEI for canola (i.e. biodiesel) is moot. transport via helium balloons as one reader suggested. But helium comes from conventional nat gas production. That’s why there is a shortage. When there is no more conventional natural gas there will be no helium for commercial uses. Fusion (hot or cold) – has been 50 years away for the last 50 years that I know of and which is still 50 years away. We could replace all coal fired electricity with solar/wind, but by the time we were done the climate would be toast if it isn’t already. Now if it had been done starting in 1970 … sure. Except they still would have had to stop growth to accomplish the goal. Robert, I think you guys are talking past each other. They are merely trying to say that a radical decrease in consumption is needed because renewables cannot support our current economy. This statement is completely true, not only from a resource perspective but a time perspective. So they are just putting the lie to Big Green. However, they obviously haven’t read your book Growth Shock since in there you very clearly state the need for degrowth for a variety of reasons! So I think you both see that renewables are necessary but not sufficient, but they are focusing on the latter (which you inherently accept) and you’re trying to convince them of the former (which they do as well). By contrast, your vision is a radical reassement of the nature of society down to the existential aims of the individual. This isn’t merely policy, it is a cultural shift of profound size. I am not convinced it is any larger than say the Enlightenment or the Industrial Revolution, although the time to undertake it is enormously short. Renewable energy is the fundamental tool to enable this philosophical shift and gives agency to any that harness it well, which the developing world is doing better than the industrial world since they have modest expectations. In that sense, it is the “steam engine” of our age, but I would not overlook the challenge of making sure people realize it is transformative instead of a direct replacement to FF. Fantastic points, Mikkel. For my part, I certainly see renewables as ‘agency.’ In any case, there’s no way to support traditional BAU on renewables. But my view is that this is a good thing. I just don’t buy that you can’t have manufacturing and industry. It’s just that industry looks quite a bit different. In any case, civilization needs base energy and going back to muscle only is a very bad outcome. Absolutely support degrowth so long as the degrowth includes equalizers (socially) and measures that increase non-growth related prosperity. In this sense, I’m pro-innovation for solutions and for less harmful and more democratic technologies. As such, my problem-solving has tended to be termed pro BAU-growth when it is not. Though I do not oppose ‘growth’ when it comes to benevolent innovation. Base consumption growth as we have seen it over the past Century is very harmful overall and needs to be cut back considerably. But I’d consider this a problem of innovation as well where we work for efficiencies and less harmful technology so we can still work to improve people’s lives. Best and thanks for jumping in! Sorry, I won’t bother you much in the future. Promise. I do love getting the well written climate information. And generally am fascinated by the posts by your readers. Thanks again. No worries, I enjoy the engaging discussion. I don’t see all the challenges as completely insurmountable. But the fact that we are now rather far behind the 8-ball is quite obvious. I honestly don’t see how building the renewables will toast the climate all by itself. We bend more steel, for example, than is needed in just one year of vehicle manufacture. And steel, in itself, does not require a coal input (Sweden, Denmark, recycling etc). RE starting in 1970… Absolutely. But we’re not in 1970, so we have to deal with the more limited options of today. But better than the far more limited options of tomorrow. Best, Pin and thanks for the thoughts. Robert, my current pet cause is to try to figure out how to communicate that “growth” as a mechanism should be separated from “growth” as an increase in overall consumption. For instance, I believe that the mechanisms of markets and investment can be used to power growth of your vision. I don’t call it “green growth” because that phrase is used by the OECD to mean expanding the economy through renewables, so instead I use the term transition. Even more generally, I believe the core dynamics of growth on a fundamental basis is essential to evolution in both biological and social terms. Once I stepped back to view society from this framing, I could see the power of neoliberalism and industrial capitalism in becoming the dominant philosophy. By contrast, sustainable steady state philosophies have dynamics that make growth impossible, such as lack of profit (or as one friend noted, simply call it “surplus”). Therefore, their pure form will always remain at a disadvantage to the current economy and not be able to supplant it. However, the strategy of transition (localization, distributed decision making, efficiency, egalitarianism) is actually more competitive than the status quo because we are at carrying capacity. So the transition strategy wins out even when looking to traditional growth metrics, as long as it has proper framing and coordination. There are a lot of conclusions to be had, but I’ve created a model demonstrating that communities can use this to self fund their own development with only modest amounts of initial investment (which they can offer risk adjusted deals better than wall street/fossil fuels on). In this sense, there is a huge potential for transition to grow very quickly, but it would require the acceptance that a) as it grew the overall economy must shrink to accommodate and b) eventually it too will saturate and so forward returns should be ratcheted down progressively until steady state makes sense. Then ideally you keep overall consumption at that level (about 80-90% lower per capita than the US currently has) and repeat the process with new innovations as they are formed. A pithy summary is that profits aren’t evil in themselves, but profit has been going from the populace and environment to enrich the few, while this system would go from the rich to the populace and from humanity overall to the rebuild the environment. In my view the word ‘growth’ has been conflated with too many things. Why is new tech and innovation seen as growth? Because markets can exploit those values to increase profits and, in turn, produce more products and consumption. So how does one decouple innovation from increases in consumption while still affecting overall prosperity? Innovation would be more aimed toward efficiency and smart use rather than focusing on increases in net volumes (flow of goods and materials). Another source I’d like to decouple is services. Non-material based services have no negative impact and if services are innovative, then they can actually help. For example — edible local landscaping services, home gardening training and assistance, etc. Innovation to reduce overall consumption without severely affecting quality of life would be extraordinarily valuable in the face of Growth Shock. Technology would be aimed more at solving problems than accumulating profit/centralizing control. Overall, I find your model to be a positive one and hope it gains traction. I just think we’ve kind of gotten ourselves into a linguistic/concept box due to how things have been traditionally defined. And I think we need to look at things in a different way. We can’t paint all innovation as bad because, in the past, innovation primarily benefited harmful growth (BAU growth). Robert, I suggest you read Charles Hugh Smith’s latest book. While it’s not about these things directly, one thing he mentions is the importance of developing well rounded skills and becoming a master of a few. His definition of master is not only to be technically adept, but to own the fruits of labor on both a material and existential basis. The book argues that the calcification of the status quo provides a unique opportunity for people to build a solid foundation that decreases their alienation from work. He also focuses on how “ownership” exists on both a personal and community level, with a specific example that a landscaper who has high levels of autonomy and skill can take pride in helping to transform and maintain their clients’ yards. Even though he doesn’t legally “own” the property, his work contributes to the well being of the community and earns social capital plus intrinsic enjoyment. He also talks about the need to focus on having skills that aren’t commodities and thus can’t be outsourced. I mention this because I believe edible landscaping services and education are a perfect example that into his framework. Just yesterday I emailed him about the possibility of collaborating on a website that would be an incubator for these types of ideas and raise investment through crowd funding (here in NZ you can offer equity/loans through crowd funding with a license we are about to receive) in order to create the business/technical/social models. These models can then be used by people who wish to gain autonomy and contribute to well being. Specifically we would only be highlighting ideas on the primary needs of energy, food, water, shelter, transportation and (potentially, but unlikely) health. Thanks for this Mikkel. I’ll be sure to give this a read. Per our previous discussion, I found these IPCC figures RE carbon intensity of renewables. Solar PV is less than 10% that of nat gas, less than 2 percent that of coal. CSP is less than 5 percent that of nat gas, less than 1 percent that of coal. Wind is even lower. The notion that we wreck the climate building the solutions is looking rather preposterous… This is the problem I have with peak oilers. Every time they spout figures I find them highly suspect of negative double counting. I agree with the push go zero fossil fuels, but the notion that there are no viable solutions is based on fuzzy math. Hi Robert, I thought that peak oil was about the unsustainability of the current production of oil and the price impacts resulting. What do they say that has to do with renewables? Wouldn’t they be advocating a switch before the higher oil price really starts to bite? Sorry, somewhat new to these debates. I’ve frequented the peak oil blogs for some time and a number of their current key proponents appear overly pessimistic when it comes to renewable energy. You can note the comments from Pin above as an example. The arguments include: renewable energy can’t exist without fossil fuels, renewable energy EROEI can’t compete with fossil fuels, building enough renewable energy to make a difference would result in enough ff emissions to wreck the climate, and you can’t run manufacturing of raw materials on renewables. In general, these claims are either false, exaggerated, or there are specific instances where they are easily refutable with even cursory research. This is in contrast to Hubbert (first peak oiler) who was a staunch supporter of renewable energy sources. As a theory, peak oil is simply the notion that the finite resource that is oil cannot continue to increase production endlessly. At some point, you hit a situation of diminishing returns and net flows of oil fall off. The base theory is a simple physical fact (you can’t endlessly increase production of a finite resource). However, the devil in the details has been in effectively timing peak oil which involves a number of factors to include accessibility of unconventional oil sources, technological ability to increase access, EROEI of the new sources, overall pace of consumption/depletion, and the availability of competitor fuel sources that are more economically appealing. The base peak oil analysis is a useful tool as it helps to time and gauge the state of overall depletion. Unfortunately, for whatever reason, a good number of the analysts appear to have a very pessimistic stake in sources other than oil. This is possibly due to the fact that many peak oilers are former and/or current oil industry professionals. And as the industry has a very myopic view of what energy sources are viable (hydrocarbon centric) this view has likely also colored the view of the current peak oil movement. Where the whole situation becomes convoluted is when you have environmentalists, who are attracted to the notion of peaking fossil fuel use, getting wrapped up in oil industry based arguments on renewable industry viability. And that can be quite a mess…. Thanks for the summary. It is amazing how people are staking positions, I wonder if it is a reflection of how specialized our society has become. Maybe we have trained ourselves to only see one position. Anyway thanks again you are a wealth of information. I honestly think that the ability to only see things one way and the failure to adapt in the event that one’s current view is wrong is the very crux of social calcification. Individually, we must choose one thing and we must be right in that choice. There are no other options. To my view, this is a rather sad mindset. Mikkel blames ego and that’s probably part of it. But I think you’ve hit on something in that we’ve been forced to specialize to survive and that probably colors the way we respond. As a “recovering” peak oiler I think he’s not referring to the theory but the community. The theory is perfectly valid and becoming increasingly vindicated if you know how to interpret events, but the community is notoriously pessimistic and rigid in its beliefs about the future. Despite several people trying to point out social phase shifts that will prevent this happening (at the very least, strict rationing and coal to liquids, which is another scale of problem entirely) for years, she has never fully engaged but keeps repeating the same claims about debt bringing down everything. I don’t believe these perspectives are wrong, because they are the logical conclusion of BAU. They just don’t have any imagination or willpower about creating a different outcome; which is a shame because the group is made up of amazingly smart and talented people that have much to offer society. The way I summarize the group is that they would rather have their analyses be right and watch things fall apart than work hard to change and potentially fail. OK, thanks for the description I appreciate it. Very interesting, it’s a little like Nature Bats Last you can give them information that shows NTE is possible but unlikely, but they prefer to philosophize and wait for death. There seems to be a tendency for people to get hung up on the potential worst case. My focus is to dentist potential problems and highly the urgency for actively working for solutions. So I can get frustrated when people get stuck in these kinds of mind sets, especially when reality is often far more nuanced than the purely pessimistic view dictates. Nailed it. Now sprinkle that mix with former oil industry types and there you have it. I’m secretly a doomer and near-NTEr on my off days. Specifically, I think peak oil response will lead to massive CO2 release and environmental destruction that will set off uncontrollable feedback loops. If it’s not methane, it’ll be the death of the ocean and weather too wild to predict at all. But I realized that fighting for life is more fulfilling than waiting for death. The world is full of people who accept death and defeat is likely but fight on anyway for a higher cause. I don’t see why we should be any different. Moreover, I realized that inaction because you are worried the world will end is just a form of egoism. Once you internalize your despondency and let the ego die, then you see you are free from the burden of fixation on consequence, and instead focus on the path. In this discussion of ERoEI, I am surprised that nobody has mentioned Biogas and Thorium. Renewables are well understood by China, and they have such a pollution problem, so you have to wonder why they are throwing so many engineers at the Thorium solution. In my research this seems to be the only way forward in supplying a base load for manufacturing and logistics. If you want to end dependency on fossil fuels we require an electrified national freight train system. In regards to manufacturing, you can’t relocate manufacturing to different hydro sites (if there is water available) and expect the US government to continue its tax revenue. The costs would be enormous. Biogas has been stated to be a problem because of methane losses in logistics. But Biogas can be located close to where the resulting electricity is needed. It seems easier to do that with Biogas than most other renewables. We already have significant municipal dumps, are they being used as effectively as possible? One more would be to see the ERoEI on the hypersteam reference I sent you R. It seems it would be extremely good. The US chose not to use Thorium because you can’t get a bomb from it. They actually gave away the designs. As a result there is an entire edifice of aging US reactors doing incredible damage (thinking Hanford in Oregon), and they have to be dismantled. There is an inevitable negative public backlash against anything nuclear. That may be the ultimate price to pay for the obsession with the production of nuclear weapons. There are great safe nuclear alternatives coming online, but ignorance will pit public opinion against using them. Biogas is enormously effective as a localized source of energy vs. trying to extract it from a landfill (which is done primarily to prevent methane leakage). It tends to get short shrift because it can only provide a small percentage of current energy demand, but in an efficient and collaborative closed loop environment it has very high impact. IMO thorium (and integrated fast reactors) are absolutely essential for baseload in most areas, but we are realistically decades away from widescale deployment. If it were up to me, we would have mass renewable rollout + efficiency measures and consumption decrease so that overall fossil fuel and base material use drops immensely. Then we have a few thorium or integrated reactors to provide baseload. The renewables handle peaks and create resiliency, so they are far more valuable to “top off” supply than simply throwing more nuclear plants at the issue (a fact that a lot of thorium proponents overlook) and of course we need to stop over consuming in general since GW is just one aspect. However, I have yet to read anyone put together this argument in full. More solar panels on houses, grow more food in our backyards and more household water tanks. More online purchases – it’s amazing how much more efficient it is than it is for everyone to be driving to the mall. Locally grown food delivery services. There are probably a host of other small changes that could be made. Little changes can have dramatic effects if it moves through a population, evolution is proof of that. Am quite interested in both Thorium and Biogas and am hopeful that India/China manage success where we’ve been calcified by old ideas/thinking. It would also be helpful to break the logjam here if some sources overseas began positive development. I agree with Mikkel in that we need a massive build renewables plan, but new baseload sources would be very helpful if viable. A non-weapons related nuclear structure with added safety would also be a positive. That said, I am somewhat leery about promises and understand that containment is a bit of a problem due to high temps RE Thorium/liquid salt corrosiveness. RE high heat capacity solar — very interested. Doing research based on the article you sent and hope to put something together soon. For the first time in 47 years of farming, Giles Norek got 10 inches (25 centimeters) of rain within 48 hours on his Saskatchewan crops. Half of his 12,000 wheat acres were flooded by the late-June deluge, and the plants that weren’t killed are struggling to survive. As many as 3 million acres in Saskatchewan and 2.5 million acres in Manitoba have been flooded and are unlikely to produce a crop, according to estimates from Saskatchewan’s government and Keystone Agricultural Producers. Fire and flood for Canada too, then. 5.5 million acres is not a drop in the bucket. Yikes! Lake Mead is at 1081 ft. It has dropped ~5.5″ in the past week (~2 ft/month). In the past 12 months it has dropped 24 feet and now is at it’s 1937 level. This 1937 level is approximately 12 months after beginning initial fill. Outflow is in the range of 10,000 to 15,000 cfs, inflow has no value recorded (doubt it is zero, likely a data propagation to web sites issue). At the current rate it will hit 1075 ft in 3 months, triggering ration regime level 1. Level 1 includes zero allotment to Nevada. It is at 39% full pool. It will be unlikely that 1075 will be hit. I suspect upstream releases would occur to avoid this. Lake Powell has good reserves (52% of full pool) and can cover the issue for the short term. Powell is releasing ~13,000 cfs, however the amount that makes it to Mead I can not find a number. Perhaps historical values could give a percentage of outflow from Powell to inflow for Mead and then be applied to current values. Long term is another issue (long term seems to be gettting shorter). Within 6 ft of level 1? Rather a bad situation. Any word on the health of other up-stream sources? Lake Powell is 90.92 feet below Full Pool (Elevation 3,700). By content, Lake Powell is 51.96% of Full Pool (24,322,000 af). Dead pool is at 3374 ft, it is currently at 3609 ft, so there is buffer there. There is an automatic trigger if Mead hits 1075 ft, where Lake Powell will discharge up to 8 million acre feet of water. It will likely not take too much to stay above 1075 due to the non linear fill required to generate 1 foot elevation ( “V” shape of canyons ). There is some upstream pressure to do the minimum at most, there is down stream efforts to gut Lake Power and put all the water in Mead. If Mead drops to 1025 or lower, Powell automatically is set to release 8 million acre feet. This would set Powell to no power generation ability (inactive pool). It seems Powell is the safety bank. Bad news for hydro. Good to see there’s still a decent buffer. If the current trend continues the Bureau of Reclamation estimates 2017 will force Level 1 restriction on Mead per below article. The Powell to Mead backup would need to have been utilized, as that is the emergency plan to keep Level 1 at bay. Great Pics in this HP article. Fantastic, Andy. Thanks for these links.